“Politics matters for development”. From project officers all the way up to the heads of multilateral development agencies, from lowest-rung civil servants to cabinet ministers, everyone who has ever worked trying to enact social, economic or political change knows this basic fact. But that does not mean that they can talk openly about it, let alone plan for the eventualities of politics or set aside budgetary items for dealing with it. Aid agencies in particular seem to be trapped in a nether realm where everyone discusses the politics of development in private, but few dare to risk their careers by engaging with it in public. That is why the rise of political economy analysis (PEA) poses an interesting dilemma. The basic principle is intuitive and almost elegant in its simplicity: many projects flounder due to limited understanding of local politics, so the answer is to build more analysis into projects to ensure greater effectiveness. And yet turning this principle into practice has proven to be less than simple. Political economy analysis is roughly 15 years old now, animating an aspiring epistemic community of practitioners from most aid agencies, as well as consultants and academics primarily based in the UK. It is still a nascent community, but one that has already become highly self-aware and self-critical. For instance, academic scholars Heather Marquette and Jonathan Fisher at the Developmental Leadership Programme have just released a very interesting paper which highlights the risk of turning analysis into a form of “intelligence gathering” that generates private donor knowledge, or underlines the fact that most PEA is “quick and dirty” instead of analytically grounded. Leni Wild, David Booth and other researcher-consultants at ODI have devoted ample time and resources to studying – and, indeed, improving – how donors conduct their analyses. And on the practitioner side, the PEA Community of Practice at the World Bank – led by people like Verena Fritz and Rachel Ort – has been hard at work documenting the application of PEA in Bank programming, hoping to generate useful operational lessons from both successful and unsuccessful case stories. Politics matters, yes; but the fact remains that mainstreaming politics is hard for donors. 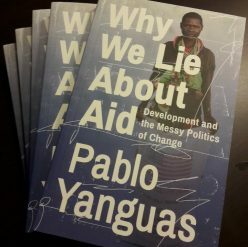 As Neil McCullogh explains in Duncan Green’s blog, the incentives for dealing with politics within aid agencies are still mostly wrong; in the words of ODI’s Alina Rocha-Menocal, working politically is like learning a language, a challenging process which requires the right environment as much as the right disposition. The rise of PEA in foreign aid circles, and its potential impact on actual development practice, depends to a large extent on whether donors as organisations can process the administrative and operational implications of taking politics seriously. Actually, it is wrong to speak of donors: instead we should speak of small, like-minded communities of operational, support and management staff; groups of self-selected individuals who advocate a role for political analysis in foreign aid organisations much too accustomed to counting things and disbursing money. That complex relationship between PEA and its advocates, on the one hand, and mainstream donor bureaucracies, on the other, is exactly what ESID’s PEA project is investigating. We have recently released two publications on the rise of political economy analysis among aid donors, and in particular within the UK Department for International Development (DFID) and the World Bank, which are commonly identified as “PEA leaders”. Our research findings are presented in ESID Working Paper 33, entitled ‘Can aid bureaucracies think politically? The administrative challenges of political economy analysis (PEA) in DFID and the World Bank‘. Those findings are summarised with practical implications in Briefing Paper 5, ‘Mainstreaming political economy analysis (PEA) in donor agencies‘. Building on over a year of primary research into how DFID and World Bank policies and operations have responded to political analysis, David Hulme and I argue in Working Paper 33 that the assumed link between political economy analysis and greater aid effectiveness depends crucially on the willingness and ability of PEA proponents to promote organisational change within donor agencies. We reach this conclusion after analysing whether the rise, dissemination and – to some extent – institutionalisation of PEA within these two donors has led to practical changes in operational planning, mission and project management, and professional training. Surprisingly enough, the fact is that while the epistemic community seems to have gained a strong foothold in these two agencies, it has mostly failed to make a dent in entrenched corporate incentives and norms. For the most part political analysis is still a fringe effort which has barely influenced actual operations. Our findings have clear practical implications: proponents of greater analysis within donor agencies have yet to demonstrate the administrative viability of PEA before they can successfully argue its policy desirability. How to do so is the subject of ESID Briefing Paper 5, ‘Mainstreaming political economy analysis (PEA) in donor agencies‘. We believe that the aspiring PEA epistemic community has so far been much too inward-looking: constantly (re-)developing models, often arguing for its own relevance, sometimes even finding succour among peers. There is now a collective realisation among practitioners, consultants and scholars alike that PEA has to be taken out of the “governance silo”: it will only be truly valuable for aid practice when politics is mainstreamed across all sectors of development assistance. The central challenge for its proponents is how to reconcile three competing objectives: maximising impact through dissemination, maintaining the sophistication of analysis, and ensuring a modicum of control over the agenda. We argue that this is an inescapable dilemma that cannot be solved: each strategy for mainstreaming political economy analysis will have its own trade-off. In the Briefing Paper we outline three such strategies: professionalisation and training for all practitioners, the incorporation of formal prerequisites in programming policies, or the transformation of PEA into a competency of senior management. The paper details the different trade-offs faced by each strategy. The next step for ESID’s PEA project is to move into a lower level of analysis: we will study the incorporation of political economy and governance analysis in specific DFID and World Bank projects in Ghana, Uganda and Bangladesh. This kind of comparative work adds to similar efforts like the Bank’s case stories to generate a body of evidence on whether and how political economy analysis increases aid effectiveness. By delving into the operational reality of aid we hope to generate analytically sound lessons for PEA proponents and sceptics alike. Politics matters for development, yes. But for development actors to do anything about it we need to demonstrate how politics is compatible with development practice. The time is ripe for reconciling politics and development across sectors, but that can only be achieved if we can come up with practical knowledge on transforming aid bureaucracies. For the time being, PEA advocates need to realise that they are not in the business of aid effectiveness, not just yet: they are in the business of organisational change.